Here is the moment in which I set down the actual theme of this blog. It appears that I am as focused as I am ever going to get, so, the focus, then, of this blog, will be gender and film. Specifically, the ways in which masculinity is presented in film. The best place to start, to me anyway, is through the action adventure and crime films of the 70s and 80s. The 70s film featured a kind of strong, silent masculinity. Men in these films were either buttoned up and suave or sort of rumpled. No matter how neat or sloppy they were, the typical wardrobe choice was a suit or slacks. Toughness was not overt, but rather, suggested. When violence occurs it isn't necessarily surprising but it isn't the theatrical well-choreographed violence of the 80s. The 70s fight sequence seemed way more believable than the 80s fight scene. The 70s character could be wounded and never springs up from a punch to the face or a kick to the groin as if nothing happened. In the 80s film, the action heroes are seemingly invincible. This is evident in their appearance. 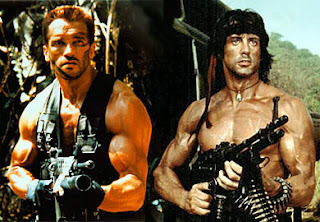 Actors such as Arnold Schwarzenegger and Sylvester Stallone's bodies are on display. They glisten with sweat, muscles and veins jump out constantly. They rarely wear suits as in them their huge physiques would look ridiculous. They wear jeans (tight ones, too) and sleeveless shirts, or very often, no shirt at all. 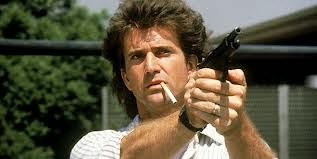 Even the least steroidal of the 80s action stars, such as Mel Gibson, display their bodies. In all the Lethal Weapon films, Sgt Riggs' very fitted faded denim jeans and cowboy boots get much attention from the camera and he also takes an opportunity to flex his biceps. The point is that a very rapid evolution occurred between these two eras. The action star transformed from moody, cerebral and hard in mind, if rather lumpy in body, to a man that was tough externally, clearly not a deep thinker, (save for a few tortured characters---I'm thinking Gibson's grieving Riggs in Lethal Weapon) who took blows and seemed to get stronger from them. In the 80s, strength becomes a purely physical thing. Soundness of body is paramount. A theory that I have concerning this change is that it is largely political. Many of the 80s action films have a very obvious conservative agenda. I aim to make a comparison of a number of films from both eras and examine what was occurring during these times that might have led to these changes.